Westminster ‘terror’ crash was an accident, suspect’s friend says. The crash outside the Houses of Parliament that sparked a terror scare was “an accident”, a friend of the suspect has said. Armed police arrested 29-year-old Salih Khater after he allegedly ploughed into cyclists and pedestrians in his Ford Fiesta before crashing into a security barrier. He was held on a terrorism charge and further arrested for attempted murder, with police initially saying he was not co-operating with investigators trying to understand a motive. Anwar Mukhta, who said he has known Khater for eight years, told ITV News the current narrative will be revealed to be a “lie”. “It is an accident, it’s nothing to do with terrorists, it’s nothing to do with any organisation that tried to make an attack to any Government department,” he added. He also described the keen footballer, a British national originally from Sudan, as a “very kind and quiet and decent person” who is “very generous” and “very smiley”. Mr Mukhta echoed other members of Khater’s community in Birmingham, saying the former accountancy student at Coventry University travelled to London to get a visa to see his family in Sudan. The suspect’s brother, Abdullah Khater, also told the BBC he was a “normal person” and that their family, originally from Darfur, were in a “state of shock”. Metropolitan Police counter-terrorism head Neil Basu said the force is treating it as a terrorist incident because of its apparently deliberate nature, the method used and the “iconic” location. Detectives were given further time to quiz Khater on Wednesday after the crash at just before 7.40am on Tuesday. 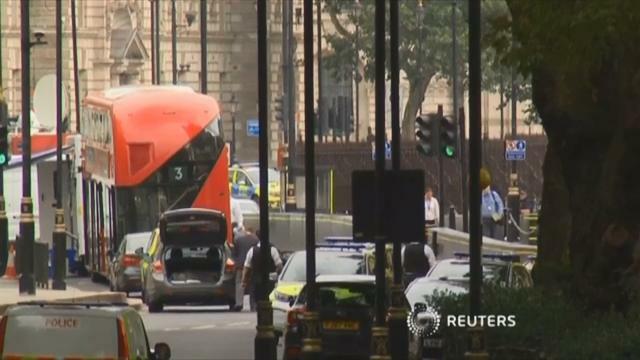 Officers said the car was driven from Birmingham to London late on Monday and spent almost five hours in the Tottenham Court Road area, before driving around Westminster for more than 90 minutes. Three people suffered non life-threatening injuries in what multiple witnesses described as a “deliberate” act. The Met Police said officers are continuing to search a property in Birmingham, while they have not found any weapons.